New Hampshire is home to many beautiful places to stay, perfect for a romantic weekend of rest and rejuvenation surrounded by nature. Check into one of these romantic inns and bed & breakfasts on your next weekend trip from New York, Boston, Portland and other East Coast cities. The Hotel Portsmouth prides itself on being a grand boutique hotel that gives the feeling of a bed and breakfast with the amenities of a larger hotel. There 32 rooms at the hotel, including standard rooms, deluxe rooms, suites, and the luxury penthouse. All rooms have a private bath, a flat-screen TV and an iPad loaded with local information. Suites include a writing desk, seating area, and an extra twin bed. Some rooms have extra bathrooms, private patios, and/or a twin sleeper sofa. There is free wireless Internet throughout the hotel. In the morning, guests can enjoy a small plates breakfast and treats in the afternoon. There is also concierge service available. 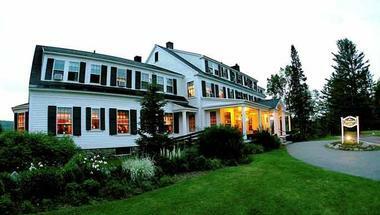 Set in a magnificent 19th century mansion on 33 acres and surrounded by the lush nature of the White Mountains, Stonehurst Manor is an upscale hotel located about 1 mile from North Conway Village. This historic hotel has 26 opulent suites and rooms decorated in a timeless European style, with classic elegance combined with modern amenities and comfort. Many rooms have four-poster beds, flat-screen TVs, Wi-Fi, fireplaces, and whirlpool tubs. Many rooms have views of the mountains. The hotel’s Italian restaurant offers gourmet meals, and a martini lounge serves great cocktails. In the season, there are tennis courts, a swimming pool, a hot tub, and a network of hiking trails through the surrounding forest. It is a perfect romantic getaway or a spot to destress and relax. 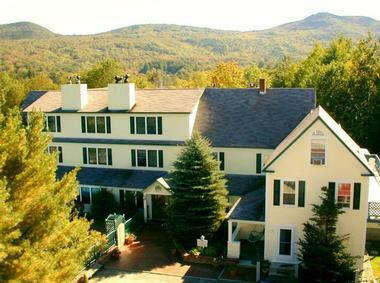 The Bernerhof Inn offers the perfect romantic getaway for couples looking to enjoy a bed and breakfast in the White Mountains. You will find high-tech amenities mixed with rich décor. The rooms all have eco-friendly air conditioning and fireplaces, flat screen TVs, DVD players, iPod docking stations, complimentary iPads to borrow during your stay, luxurious bedding, and free wireless Internet. All rooms have private baths, some of which feature a full bath with a tub or a whirlpool tub. The inn has an Electric Car Charging station for guests to use. During your stay, you can attend one of the classes at the Our Taste of the Mountains Cooking School or enjoy a relaxing treatment at the Spa. The staff is ready to provide advice on nearby attractions, including hiking, climbing, and skiing. 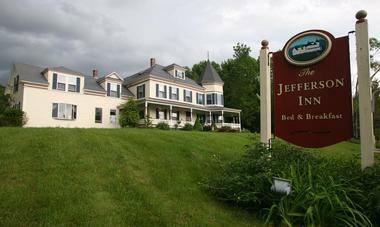 The inn hosts several events each month, including semi-frequent murder mystery weekends. The inn also has its own Black Bear Pub with local microbrews, wine, and other drinks along with typical pub fare. You can also book a package that includes private dining with meals made by the inn’s chef. All guests can enjoy breakfast, which is cooked to order. 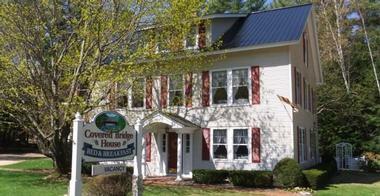 This bed and breakfast is a short walk or drive from North Conway Village along with all the other nearby attractions. There are ten guestrooms in the inn, each with their own unique decorations. There is free wireless Internet throughout the property, and each room has a king bed, a queen bed, or a pair of twin beds. They all feature private baths, TVs with DVD players, central air conditioning, clock radios with alarms and smartphone docking, and hair dryers. Some rooms also have two-person Jacuzzis or fireplaces or are wheelchair accessible. 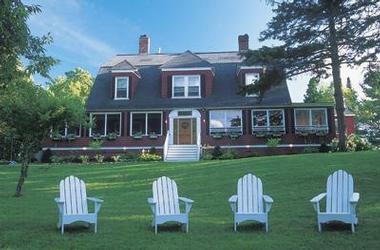 The inn features a front porch with Adirondack chairs, a seasonal open-air hot tub, and a seasonal heated outdoor pool. Inside, you can relax in the living room or family room. There is also a Mt. Surprise Room with a guest fridge, microwave, bar area, 50-inch TV with VCR/DVD player, and plenty of books, magazines, and games. All guests can start the day with a delicious handmade gourmet breakfast, and the inn is always prepared to accommodate dietary restrictions, including gluten intolerances. In the afternoon, you can enjoy the afternoon tea with beverage service along with some home baked treats. The Three Chimneys Inn gives guests the chance to stay in a building that dates back to 1649 and is on the National Register of Historic Places. After undergoing extensive renovations during the 90s, it is now a hotel with 23 guest rooms and spectacular entertainment and dining. The rooms are located in the original 1649 homestead as well as the 1795 Carriage House. Every room has unique furnishings and artwork, overstuffed lounge chairs, and polished wood floors. Guests also get private baths, individual air conditioning and heating controls, wireless Internet, irons with ironing boards, make-up mirrors, hair dryers, cable TV, coffee makers, and eco-friendly spa amenities. Some rooms also have private entrances, double sized showers, skylights, Jacuzzi tubs, gas fireplaces, and handicapped accessibility. Guests can take advantage of the free on-site parking. The ffrost Sawyer Tavern has an open-hearth fireplace and promises a cozy dining experience for dinner every night of the week. Cranmore Mt. Lodge Bed and Breakfast is a relaxing getaway on a secluded property of over 8 acres, and it is still close to nearby attractions and dining. The building dates back to the 1840s and features 20 guestrooms, including several that are dog friendly. All rooms have unique décor, private baths, wireless Internet, phones, individual air conditioning, and cable TVs, and they are smoke-free. Four of the rooms are suites and two of these feature kitchenettes. Many rooms also have fridges, coffeemakers, and microwaves. To entertain the guests, the inn has an outdoor swimming pool, a hot tub, a nature pond with rainbow trout, a basketball court, a mountain stream, barbecue grills, and picnic tables. The living room has a baby grand piano and a wood fireplace, while the Game Room has a DVD and VHS library, train table, and board games. Guests can use the microwave and guest fridge whenever they want. All guests can enjoy the gourmet breakfast, which is cooked to order and allows you to choose from several entrees. There is access to complimentary tea and coffee all day every day. 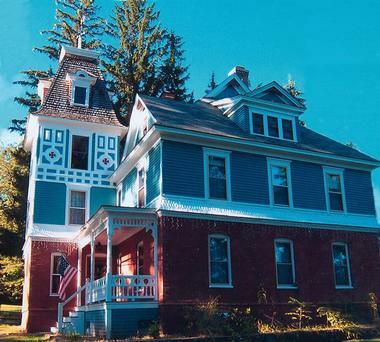 This Victorian bed and breakfast was built in 1896 and gives guests gorgeous views of the surrounding mountains. Each of the 11 rooms has a private bath and mountain views, and there are also two-bedroom family suites with fridges and TVs. Some rooms also have rocking chairs, daybeds, windows seats, and skylights. All rooms have extra pillows, luxurious and warm sheets, private baths, oversized towels, custom toiletries, and wireless Internet. The inn features a large wraparound porch and offers direct access to snowmobiling, cross-country skiing, cycling, hiking, golfing, and ice skating. The sitting room has original artwork as well as reproductions. You can watch cable TV, play board games, or read one of the many books. Complimentary breakfast is served every morning in the dining room and includes fresh fruit, country style orange juice, apple juice, local micro-roast coffee, a range of tea, hot cider and hot chocolate in winter, breakfast meat, egg specialties, and local maple syrup. The inn can accommodate dietary restrictions with notice. 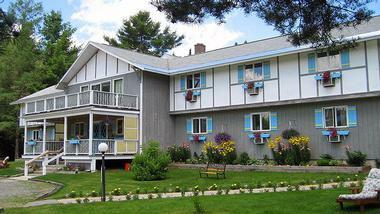 Spruce Moose is a relaxing bed and breakfast in a quiet location that is just a five-minute walk from North Conway Village. There are lodge rooms as well as dog-friendly cottages and several vacation house rentals. The cottages feature full kitchens, and the largest can accommodate up to 6 guests. They have amenities such as dining areas, gas fireplaces, and pullout sofas. There are two different one-room studio apartments with two-person Jacuzzis, TVs, phones, gas fireplaces, and small fridges. All rooms have private baths, sitting chairs, individual air conditioning, and bathroom toiletries. The Great Room in the Lodge is perfect for doing a puzzle, reading a book, sitting by the fireplace, or just relaxing and socializing. If you stay in one of the rooms in the lodge, a complimentary Country Breakfast is included. The Bartlett Inn is close enough to North Conway to give guests easy access to the village but still far enough away to offer peace and quiet along with some extra privacy. All rooms come with air conditioning and free wireless Internet. You can choose a room with a Jacuzzi whirlpool or wood fireplace. Some rooms also have kitchenettes, claw-foot tubs, gas wood stoves, large flat-screen TVs, large decks, 6-jet spa showers, or sitting rooms. The innkeepers and owners are familiar with all the local outdoor activities and other attractions and can make great suggestions for you or your family. The inn is also pet-friendly, meaning you can bring your pooch along. The included breakfast is delicious and promises fresh fruit, eggs, the choice of breakfast meat (sausage, bacon, or vegetarian sausage), an English muffin or toast, juice, tea, and coffee. There is also a daily special, and the inn can help with gluten-free or vegetarian diets. The Covered Bridge House promises a relaxing getaway for couples and families. There are five guestrooms with individual decorations that combine modern conveniences with antique furnishings. The beds are made up with down comforters, plenty of pillows, and plush mattresses. The rooms also feature an iHome alarm clock, private bathrooms with soap, shampoo, and lotion, air conditioning, a dresser, magazines, hair dryers, a dresser, and a closet with a luggage rack. Families can opt for the two-bedroom family suite with a queen-size bed and two twins plus a private bathroom and TV in the room featuring twin beds. 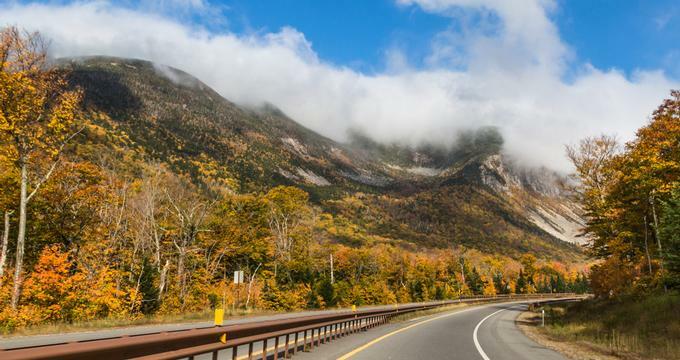 Guests at the Covered Bridge House get free passes for the nearby Great Glen Trails in Pinkham Notch along the base of Mount Washington. These trails are good for snow tubing, snowshoeing, skiing, and more. The price of staying at the bed and breakfast includes a full country breakfast. 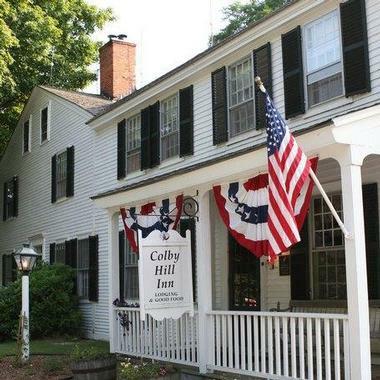 The Colby Hill Inn is situated right in Henniker, a quintessential New England town. Guests can stay in one of the 14 rooms, each of which has its own décor, and enjoy walking around the more than 5 acres of land. Every room has a radio alarm clock with CD player, telephone, and private bath along with cozy down comforters, hairdryers, fluffy bathrobes, wireless Internet, and central air conditioning. Some also have wood or gas fireplaces and/or in-room whirlpools for two. The luxury suites have TVs with DVD players and access to a DVD library. The inn has a library with a TV, an in-ground pool, historical perennial gardens, and wicker furniture in a garden gazebo. You can also play croquet, volleyball, or badminton. The turndown service includes chocolates, and there are fresh baked cookies available in the afternoon. At any time, you can enjoy hot cocoa, tea, or coffee. The Grazing Room is the on-site restaurant that serves unique and delicious meals made from local foods. The day begins with a five-course breakfast made from local, fresh produce. The menu varies by day but includes organic coffee, a grain or parfait course, a juice cleanser course, a freshly baked course, an entrée course, and a sweet ending. The Glenn Oaks Inn is one of the most popular Jackson bed and breakfasts, providing romance and relaxation on a 24-acre wooded property. Guests can stay in one of the eight main houserooms or one of the three cottages. Every room has a queen bed, private bath, phone, wireless Internet, cable TV, and air conditioning. The cottages have even more amenities such as fridges, CD players, and fireplaces. Some rooms and cottages also have wood-burning fireplaces, a tub/shower combination, and jetted tubs for two. There is also a two-room suite available. During the day, guests can relax by the wood-burning fireplace or sit on the sunny porch. In the afternoon, guests can enjoy complimentary homemade refreshments, and the day begins with a full country breakfast. You can access the Early Morning Beverage Bar for tea or coffee before breakfast. The meal includes juice, something sweet and homemade, and the option of two entrees along with a breakfast meat. The Henry Whipple House Bed & Breakfast was built in 1904 and is a typical Victorian building with hardwood floors, oak woodwork, stained glass windows, and chandeliers. There are five chambers in the main house and three carriage house suites, each of which features antiques, luxury linens, and art. Some rooms also have bronze engraved fireplaces and full kitchens. All rooms have Internet access, air conditioning, cable TV, and a private bathroom with a shower and/or tub. Rooms have queen or king sized beds or a combination of these and twin or full beds. There is a guest kitchen where you can find complimentary cold and hot beverages, a water cooler, snacks, homemade cookies, and a fridge for guest use. All guests also get a complimentary gourmet breakfast. The Inn at Jackson was built in 1902 and features classic architecture. Each of the 14 guestrooms has unique décor and a private bath. Many rooms also have fireplaces and great views. Every room has cable TV with a DVD player and air conditioning. Depending on the room, you may also get a shower and tub, a private entrance to the porch, Jacuzzi tubs, a loveseat, antique furniture, sitting areas, sleigh beds, skylights, and gorgeous views. The inn features a beautiful foyer, a relaxing dining room, and a wraparound porch, along with a living room and a quaint bar. Guests have access to the private trout pond, horseback riding, and an outdoor heated pool at Whitney’s Inn, located a few miles away. That is also where you will find the Shovel Handle Pub. In the morning, guests can enjoy a complimentary three-course full country breakfast. In addition to one of four entrees, guests also get homemade baked goods, assorted teas, coffee, or juice, and fresh fruit, cereal, and granola. Situated right by one of Jackson’s sparkling mountain streams, the Inn at Ellis River is great for a weekend getaway. There are 20 rooms along with a rustic cottage. Most have fireplaces and many also have balconies and/or two-person Jacuzzis. Every room has period furnishings and air conditioning. Guests can choose from a Classic, Fireplace, or Jacuzzi Room. Classic rooms feature queen, king, or two double beds, while Fireplace Rooms have a traditional gas or electric fireplace, and Jacuzzi rooms have a jetted tub for two people. Unwind in the game room, sitting room with puzzles, pub, atrium-enclosed hot tub, sauna, outdoor heated swimming pool, or gazebo. Guests can also simply stroll through the gardens for a peaceful afternoon or evening. There is a fireplace right in the lobby that the inn lights in the fall and winter. You can enjoy your complimentary gourmet country breakfast in the sunny dining room. Breakfast is made with regional and local food products and includes hot chocolate, tea, or coffee along with fruit juice, homemade granola, fresh fruit, cereal, yogurt, and fresh baked goods along with a choice of two entrees, each with toast and/or breakfast meat. In the afternoon, there are cookies and other sweet treats, and coffee and tea are available all day long. The Red Elephant Inn Bed & Breakfast, open year-round, is located at the end of a quiet wooded lane close to the main route in the village. 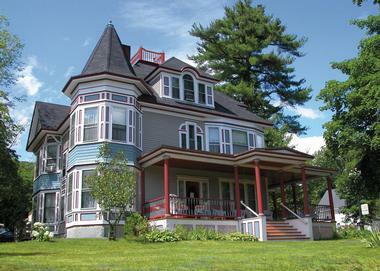 It is within a short walk of North Conway but does not have too much hustle and bustle. Each of the eight guestrooms has its own layout and view. They all have private baths and air conditioning along with a king or queen bed. Some rooms also have gas-burning stoves or fireplaces, cable TVs with VHS/DVD players, or Jacuzzi-style tubs. There is also wireless Internet on the property. The style of the Red Elephant Inn seeks inspiration from the art-deco era. Guests can relax in the swimming pool, sit on the porch, or sit by the fireplace in the library and look at the Moat Range. The library has books, including trail maps and guide books. No matter the time of the day, there is access to hot chocolate, cider, international coffee, and tea plus snacks and fresh fruit. A daily full breakfast is served in the dining room. The Riverwood Inn is right across Jackson’s Village picturesque covered bridge. This bed and breakfast has more than five acres of land, including rolling woodlands, wild fields, and tended gardens and lawns. The inn combines modern amenities with 130 years of the building’s history. 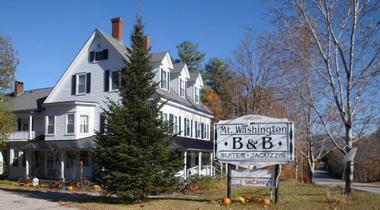 There are seven inn rooms and six carriage house rooms for guests to stay in. Rooms have luxurious bedding, wireless Internet, LED televisions with cable, custom draperies, Turkish towels, private baths, and luxury bath amenities. Some of the rooms in the carriage house also have kitchenettes and private balconies, and some accommodations even have claw-foot tubs, window seats, porches, whirlpool spas, and the ability to adjoin with other rooms. The verandah has rocking chairs where you can spend a pleasant afternoon, or you can cool off in the shade of the gazebo. The inn even has a private beach along the Wildcat River where you will find small pools filled with trout. This is also a great spot for fly-fishing. There is also a living room with a fireplace, a library, a pool deck, and patio. The breakfast room features beautiful cathedral ceilings. The Cranmore Inn has been hosting guests since 1863 and prides itself on being an authentic country inn in the bed and breakfast style. There are 17 guest rooms plus two apartments, and all have toiletries, private baths, and air conditioning. You can borrow a hair dryer from the front desk for your stay. There are numerous room configurations, including those that sleep up to 6 guests and include multiple flat-screen TVs, full kitchens, living rooms, in-room two-person Jacuzzis, tub/shower combinations, cathedral ceilings, twin trundle day beds, direct access to the yard and back deck, and private entrances. The inn has a hot tub that is operational all year round, letting you warm up on a cold day. Other inn amenities include wireless Internet, the seasonal outdoor pool, the backyard patio, the picnic area, and the front porch. The Cranmore Inn means allows access to all the White Mountain activities such as mountain biking, hiking, river kayaking, antiquing, and more. The rates include a full breakfast cooked to order. 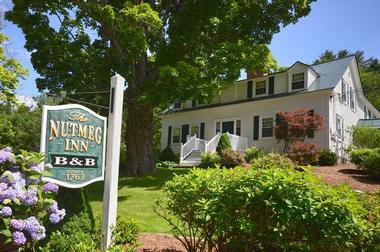 The Nutmeg Inn dates back to 1763, combining a relaxing historic experience with modern amenities and an ideal escape from daily life. Each room has air conditioning, a private bath, hair dryers, extra blankets and pillows, luxury bed linens and towels, shampoo, conditioner, and soap. Guests can easily entertain themselves all day on the 7-acre property with its fireplace in the Great Room, movie collection in the West Parlor, Billiard Room, and seasonal in-ground heated swimming pool. The inn also has an exercise room, fireplace logs, a refrigerator in the guest kitchen, and free wireless Internet. The inn is just five minutes from Lake Winnipesaukee and downtown Meredith where you will find plenty of things to do. There is a complimentary homemade breakfast every morning, including fruit and a main entrée along with homemade bread, granola, yogurt, juice, coffee, and tea. Guests who need to leave early can also opt for an earlier continental breakfast. 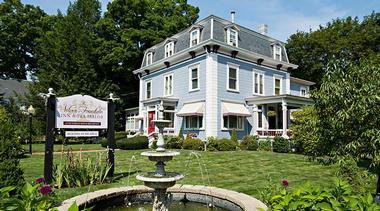 The Silver Fountain Inn was built in 1871 and is a three-story Victorian building that holds a bed and breakfast as well as a tea parlor. The building has stunning architecture including Italian carved plaster ceilings, marble baseboards, and Belgian light fixtures. All rooms have free wireless Internet, irons, cable TV, mini-fridges, luxurious robes, private baths, toiletries, and hair dryers. Some rooms also have sitting chairs, electric fireplaces, dark cherry armoires, Victorian vanity sets, chaise lounges, and/or day beds. A full breakfast is included in the room rate and there are cookies, tea, and coffee in the afternoon. You can also opt to enjoy lunch in the Tea Parlor where you will find rotating monthly specials. 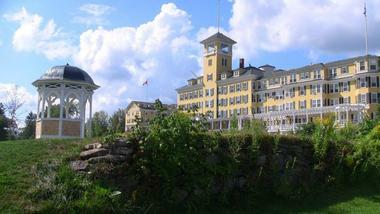 The inn also hosts various events such as themed dinner theaters and murder mystery nights. Carlson’s Lodge sits on 50 wooded acres and provides guests with on-site activities and easy access to other attractions. Each of the hotel rooms has air conditioning, a ceiling fan, a full private bath, and cable TV. Some rooms also have a kitchenette with a microwave, toaster, coffeemaker, sink, fridge, and two-burner stove along with pots, pans, dishes, and silverware. Rooms can have a full size bed, a queen bed, two queen beds, or two full size beds, and there are options for two-room family suites. The lodge also hosts a living room lobby along with an upstairs balcony. You can play in the game room where there are pool, bumper pool, and ping pong tables. Guests can also take advantage of the free wireless Internet, guest fridge and microwave, outdoor pool, playground, and pond. All guests receive a continental breakfast. 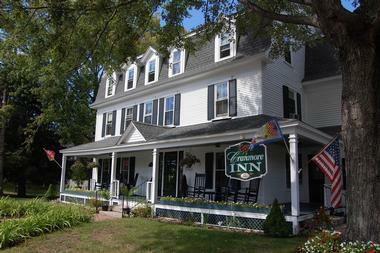 The Franconia Inn has been serving guests since 1863 and sits on 107 acres of land in Easton Valley. The three-story building is in the colonial style and has 35 rooms within the inn with a double bed in the Cozy rooms and a queen and single, two double, a queen, or a king in the Spacious rooms. There are also Standard rooms, which are somewhere in the middle. All rooms have private baths. Guests can also consider staying in one of the suites, including the Honeymoon Suite with its Jacuzzi and view, the Family Suite that connects two rooms with a common bath, and the Inn Suite with a queen bed, queen sleeper sofa, Jacuzzi, balcony, kitchenette, and fireplace. Larger groups can stay in the Kinsman Cottage. Because of the large property, guests can enjoy numerous activities right on site. There is fishing, swimming, glider rides, tennis, hiking, horseback riding, cross-country skiing, snowshoeing, tubing, ice-skating, and groomed trails. Inside, you can relax in the living room or private library, both of which have fireplaces. There are also verandahs in both the front and rear of the building. Guests can enjoy a country breakfast in the morning or make a reservation for dinner. After, spend an evening relaxing in the Rathskeller Lounge. Cheney House is a restored Victorian home dating to 1895 in the countryside. There are four guest rooms with private baths for guests to choose from. Three of the rooms have tubs with a Jacuzzi jet, three rooms have queen beds with pillow top mattresses, and the other room has twin beds. The rooms also have cable TVs with a DVD/VCR, air conditioning, portable fireplaces, wireless Internet, and luxurious robes, bedding, and towels. When not in their rooms, guests can borrow a movie from the DVD/video library or sit in the living room while enjoying a fire in the fireplace. There is also a sitting room on the second-floor and an exercise room with a treadmill. You can also relax in the train room, do a puzzle, or play a board game, sit at the picnic table in the backyard, or stroll through the flower gardens. The guest fridge always has spring water. You will wake up with the smell of freshly brewed coffee and fresh homemade breads. The Mt. Washington Bed and Breakfast is inside a picturesque farmhouse in the Federal style, and it was built during the middle of the 1800s. The structure has served as a bed and breakfast for the majority of its life, and the current owners have been running it since 1999. The seven guest rooms have air conditioning, free wireless Internet, and private baths. The suites also have a TV with a VCR/DVD player, full bath, sitting room, and sofa bed. Deluxe suites have a sitting room, queen bed, and full bath featuring a whirlpool tub. There are also two king rooms and a double room. Guests can look out from the bed and breakfast and enjoy the view of the Reflection Pond and Androscoggin River along with other features of the Androscoggin River Valley. They can also relax inside in the sitting room or outside on the porch. The day begins with a full home-cooked breakfast with fresh coffee, fruit, orange juice, and a hot meal made with locally grown organic produce. It also includes breakfast meat or a vegetarian option, eggs, cereal, and homemade granola. The afternoon involves home-baked treats, and you can always find beverages available. 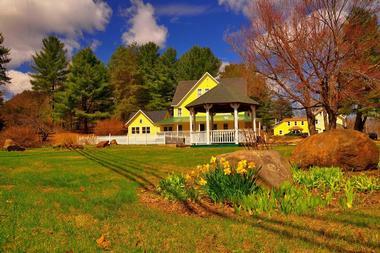 The Nereledge Inn is located in one of the first farmhouses to be built in the area, dating back to 1787. This casual bed and breakfast is just a short walk from the village’s activities and the nearby Saco River where guests can enjoy a variety of outdoor activities. Each of the eleven rooms is air-conditioned and has twin, queen, and/or king beds. Some rooms have private bathrooms while others have shared ones, and some of the rooms also have room for an extra futon or cot. Depending on the room you choose, you may have a tub plus shower, an extra comfortable chair, or the ability to adjoin with other rooms to create a family suite. Guests can relax in the multiple living rooms with their comfortable furniture, magazines, books, puzzles, and games. There are fireplaces to enjoy in the winter and picture windows to let in light in the summer. The wrap-around porch has a few rocking chairs to help you relax. The rooms have TVs with VCRs. There is also a guest pantry where you can use the communal refrigerator, microwave, electric kettle, dishes, popcorn, and coffee. Breakfast is complimentary and includes tea or coffee, juice, homemade muffins, and either eggs, an omelet, French toast, or pancakes.